Now I definitely CANNOT take credit for the idea or the steps. I found this Easy Origami book from the library. Definitely check that book out because the designs and ideas are stunning! 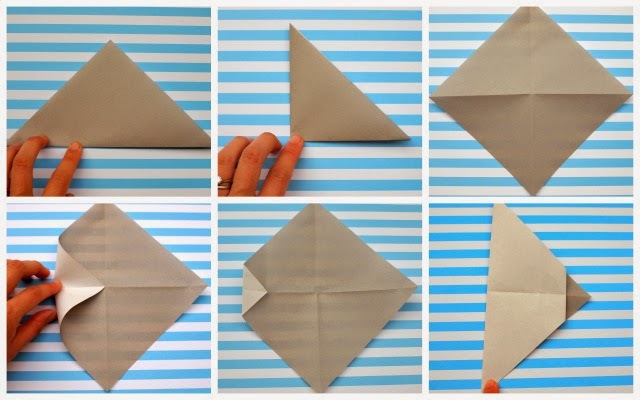 Today I'm posting the directions here because I found the steps to this origami craft pretty confusing. (I'm an origami newbie.) So I shortened the original steps, clarified other confusing steps, and added some cute extra details! Let's watch an origami video tutorial! Directions to Fold Origami Faces from Pink Stripey Socks on Vimeo. 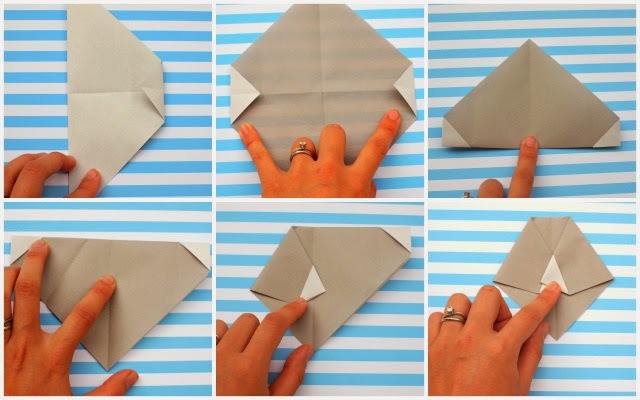 Fold your paper in half diagonally. Now we're going to figure out how to fold our left corner about 1/4 of the way on the left side. To do that, I first folded my left corner to the middle and then gently pressed down to mark where the 1/2 way mark was. To make a similar fold on the other side, I folded the paper in half. Then, I folded the corner right over. Now I have a fold about 1/4 of the way on the right side too. Open it up and admire your folds. Now fold the paper in half. 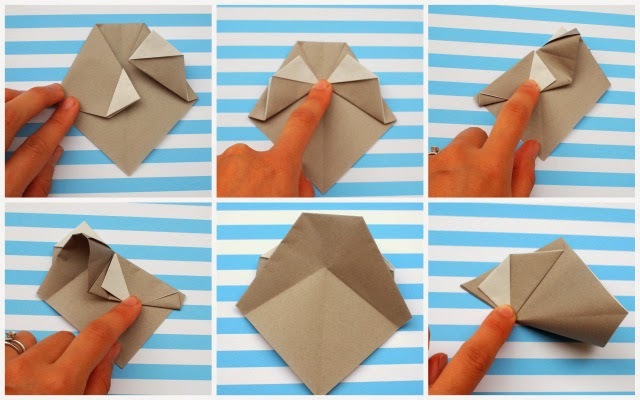 Repeat this process with the other side, making an identical, matching fold! Fold your right triangle up to meet the top of your face. Fold the left side similarly. Make sure that the two corners of your triangle touch the middle folded line. Here comes the tricky part. (You may want to watch the movie.) We're going to make the nose. To do that, we have to first fold some guiding lines to help the paper bend the right way. The guiding lines are basically just us folding our paper around the eye folds onto the other side. Ready? Ok. Flip your face over. Then, fold the left side of your paper back, following the line of the folds from the other side. Make sure to end your crease at the middle line. Lift up the left side and and repeat this same process with the other side. When you open it up, you should have two folds like this that stop at the middle line. Now we're going to fold two more lines. Lift up your origami face and press down, tracing the top fold from the other side. Open your face back up. Push down the top flap and you've created some cheeks. Push your nose side to side to help with the next step. 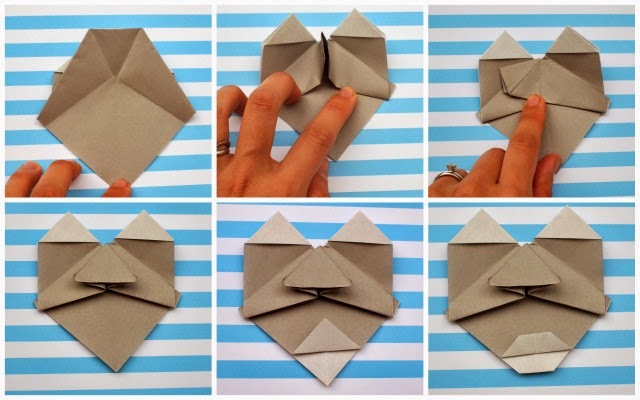 Fold the bottom corner up to create a lip! Now fold the two corners back to create lips. 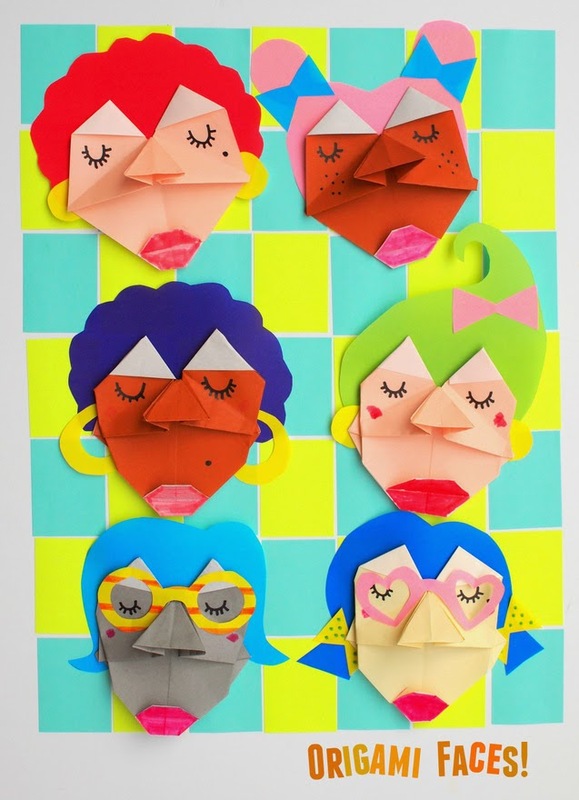 Then, use markers, scissors, and other sheets of origami paper to decorate your faces! And if you liked this modern origami craft, definitely check out my other origami and paper folding crafts! Here are some of my faves!